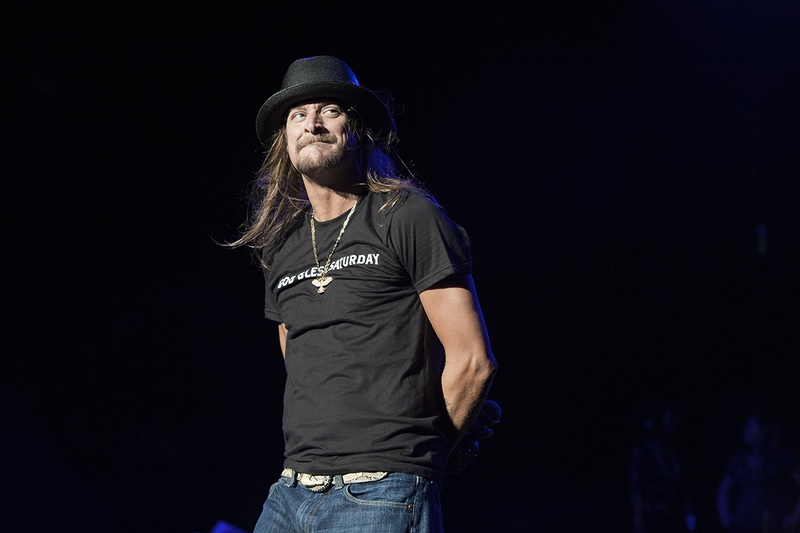 Michigan musician Kid Rock on Monday responded to criticisms that he is the wrong act to open the taxpayer-subsidized Little Caesars Arena this week because of his politics and past use of the Confederate battle flag. After the article, Kid Rock is a disgrace. Why is he first act of Little Caesars Arena?, Detroit Free Press columnist Stephen Henderson also slammed the selection and the arena’s owner, citing among other things that hundreds of millions of public dollars spent on the new arena in majority black Detroit. Meanwhile, a civil rights group, the National Action Network, planned a protest outside Kid Rock’s concerts, which begin Tuesday. Kid Rock is a disgrace. Why is he first act of Little Caesars Arena? Detroit taxpayers subsidized the city’s new arena. It’s a bad look to have its first performance be from a singer who championed the Confederacy. The arena’s owner, Chris Ilitch of Ilitch Holdings, said he “can’t control what any artist does or says.” Mayor Mike Duggan also weighed in on the fray last week, saying that those who don’t like Kid Rock, who has mused about the possibility of running for U.S. Senate, shouldn’t attend his concert. I am the bonified KING OF DETROIT LOVE and it makes me smile down deep that you haters know that! Your jealousy is merely a reflection of disgust for your own failures and lack of positive ideas for our city. Love him or hate him, you always know exactly how he feels and what he means. Exactly the opposite of most politicians who will say whatever they think the audience wants to hear. And your title misquoted and misrepresented his full statement. Shame on you. He said he is "King of Detroit LOVE" -- what other musician other than Ted Nugget has stepped out and helped our city and the State of Michigan. I will read your articles with some reservation now. Your bias is showing. If the people working at The Bridge wonder why the term "Fake News" gets thrown around so much (and at them as well), this article is a perfect example. First, The Bridge posts an article from someone who essentially has done nothing with her life and is somehow now an expert at running a successful business or local government. Making matters worse, The Bridge apparently doesn't even bother to fact-check her claims before printing it. Then, it cites the Freep's Stephen Henderson whom every other piece he has apparently written deals with the boogeyman of incessant racism. It's a shame that this is 2017 and not 1717! "Want to influence a casino bid? Polish your corporate image? Not be labeled a racist? “Al Sharpton has enriched himself and NAN for years by threatening companies with bad publicity if they didn’t come to terms with him. Put simply, Sharpton specializes in shakedowns,” said Ken Boehm, chairman of the National Legal & Policy Center, a Virginia-based watchdog group that has produced a book on Sharpton." At least Chevrolet wised up to what a scam NAN really is (ironically with Kid Rock), grew a spine and didn't give into that organization's demand for silence. Finally, you cannot even copy and paste something put out by Kid Rock correctly, "omitting" a word and changing the very meaning of what the man had said. Doesn't anyone bother checking material before it is posted on your website? If The Bridge wonders why it gets slapped with the "Fake News' moniker, it only needs to look at the closest mirror. I wish Kid Rock the best of luck at his upcoming shows and hopes that he'll be able to find worthwhile organizations to support with just a little bit more courage (and appreciation for his generosity) in the future. Then stop reading and commenting on The Bridge. Kid Rock is a Trumpanzee and a racist period. Sorry you didn't want to notice that. Kid Rock's political leaning are not germane to the topic at hand. This stratagem didn't work for Ms. Johnson and it certainly won't work for you. So, Kid Rock is a "racist"? Naturally you'll easily be able to provide the facts to back up your assertion. Ms. Johnson & Mr. Henderson were a little light on details when they wrote their respective pieces. I missed the part where they detailed the lynchings, bombings and cross-burnings he personally took part in. Hopefully, you'll be able to do better. Why am I commenting on this? Because right is right and wrong is wrong, and that's all that matters here. If you want to rip on a public figure, especially someone who has done as much as Kid Rock has for the Detroit Area, that's your prerogative. But at the very least, you should have the integrity to back up what you are saying with some facts. "R-E-S-P-E-C-T. Bridge’s journalism will be fact-based and will respect the good sense of our readers." At best, this series of articles on Kid Rock has been clickbait. The man sold out four shows at LCA in one day and then the two shows added right after those. It's a safe bet that there are a lot more people out who feel the same as I and are turned off by this so-called "fact based" reporting. That been said, I'll be eagerly awaiting your fact-based reply, Rick. As the author clearly states, we are seeing these results because we have under-funded our schools for years. Personally, I call it the "Walmartification of education." I would support the idea of districts paying some or all of the costs of post-secondary remediation and it should start five years AFTER we begin to appropriately fund our schools. Kid Rock should have styed in school. Use of the Confederate Flag shows everyone who you are. You want to go back to owning slaves that is the message of the Confederate flag. Sorry to see that Bridge gave KR a free platform for his message. If it's here in order to support some kind of balance, it didn't work. Much better to just not talk about him. He's not news.